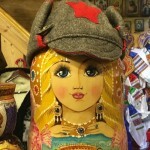 This is a logical sequel to my last blog post about documents that are needed when hiring in Russia. In this blog post, I want to discuss the end of employment contracts. My aim is to give you a good overview of the possibilities that Russian law offers to end the relationship between employer and employee. I have laid off Russian employees several times, so I hope that, besides describing the rules, I can give you some practical insight also. Although I have tried to be reasonably thorough in this piece, I want to emphasize that not all scenarios are covered. I would recommend using this text to develop a good understanding of the possibilities to end relations with your employee before you talk to a lawyer. Together with a lawyer, you can draw up a scenario that conforms with both Russian law and with your personal wishes. At Van Rhijn & Partners we can help you not only with drawing up all the necessary legal documentation that is required, but also offer the possibility to inform the employee and further handle communication in a respectful, professional, and effective way. The most important law in this article is the Russian labour code (Трудовой Кодекс Российский Федерации). With reference to articles in this blog post, I mean articles from this law, unless indicated otherwise. Termination in case the employee wishes to switch to another employer or to a position for which he has to be elected. Termination in connection with refusal of the employee to perform the work that that has been offered to him (in case the circumstances under which the labour agreement was signed have changed). Termination in connection with the refusal of a different position by an employee who is no longer suitable for his current position, because of a medical condition. 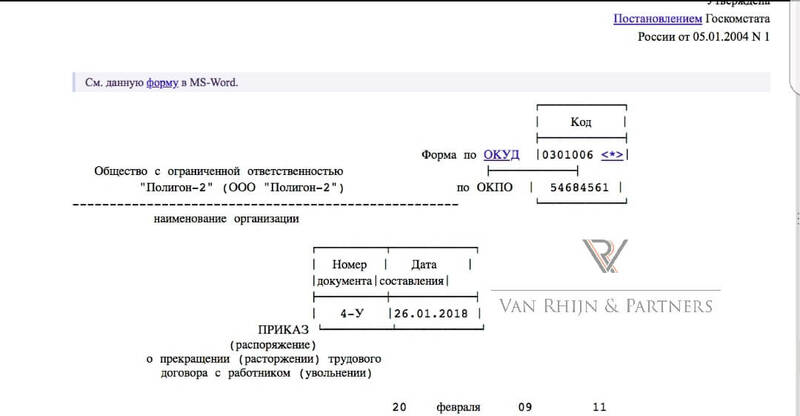 Termination in connection with refusal by the employee to move with the employer to another place within Russia. In many cases, this will be the best way to terminate a labour agreement. With some exceptions, parties are free to terminate the agreement between them when and how they want. They are, however not allowed to deviate from imperative norms of Russian labour law. Article 140, for example, contains such an imperative norm. This article provides that the employee must be paid all money he is entitled to on the last day he is contractually employed by the company. This payment may not be postponed. Such a request is rather strange in my opinion, since the employee might as well just quit his job without the mutual consent procedure. In that case, however, he needs to inform his company 2 weeks before he quits (in certain cases this period is shorter, more about that in the next section). The agreement to terminate the labour agreement needs to be written down and at least 2 copies must be made(one for each party). Often the labour agreement is terminated by an additional agreement to it. It is important that the employee signs the copy of the employer, so that it can be proven that the contract was actually terminated. On (what is formally) his last working day the employee should receive salary for the period he just worked and compensation for unused holidays. If parties agreed to grant compensation to the employee for the termination of the contract, this sum should also be paid on his last working day. The employee may be given three average monthly salary free of tax (article 217 paragraph 3 of the Russian Tax Code). Everything on top of that will be taxed according to the rate that normally applies to this employee. Employers like to terminate an employment contract by mutual consent, because it does not offer the option for the employee to withdraw his consent if he changes his mind. If, on the other hand, the employee terminates the contract unilaterally, following the Article 80 procedure, which I discuss below, he does have the right to get his job back if he changes his mind. What could be seen as a disadvantage of this way of termination is that normally the employee is offered monetary compensation (usually at least 2 average monthly salaries and a compensation for unused holidays). As I described in my blog post about documents needed when hiring in Russia, a fixed-term labour agreement is the exception in Russia. The concept of a fixed-term employment contract is defined in Article 59. This is a very detailed article, which I might separately discuss in another blog post. Here it suffices to say that, if a fixed-term employment was signed without a valid reason to do so, the contract will be seen as without a term. Consequently such a contract will not be terminable. However if you are dealing with a fixed term employment contract that justifiably has a fixed term, you may terminate it when the term ends, according to Article 77 paragraph 2. This means you still have to terminate the contract! If you fail to do so and the employee continues his work, the contract will be seen as one without a term. If you choose this way of dismissal you have to inform the employee that his employment contract will soon expire and will not be prolonged. This must be done no later than 3 days before the fixed-term employment contract ends. The employeе should sign this notification, so that it can be proven that he has received it. An employment contract for carrying out seasonal work will end when the period (season) when this work can be conducted ends. Illness of the employee will not extend the 3-day term. So, if an employee is ill, you still need to inform him. You are not allowed to dismiss an employee during her pregnancy, unless she is replacing an employee who is temporarily absent. This way of dismissal is one of the more straightforward ones. Since a Russian employee might be afraid of damage to his reputation for being dismissed by the employer for acting negligently ( an annotation of which will be made in his employment record book) this way of dismissal is sometimes used as a way to avoid such a bad annotation. By quitting ‘by his own initiative’ he leaves his reputation intact. The employee may not, however, be forced into writing a request to be dismissed. Deze manier van opzeggen van de arbeidsovereenkomst is een van de eenvoudigere. Deze ontslaggrond wordt vaak ook gebruikt om de werknemer tegemoet te komen. De Russische werknemer is vaak huiverig voor een vermelding in zijn arbeidsboekje van ontslag wegens disciplinaire sancties. Door op ‘eigen initiatief’ ontslag te nemen houdt hij de eer aan zichzelf en zijn reputatie intact. De werknemer mag echter niet gedwongen worden een ontslagverzoek in te dienen. Het ontslag is niet geldig als hij hard kan maken dat het indienen van het ontslagverzoek hem werd opgelegd door de werkgever. De enkele aanwezig van het verzoek is onvoldoende bewijs om aan te tonen dat het ontslag daadwerkelijk vrijwillig van aard was. The request to be dismissed must be written down and must be handed to the employer either in person or by mail. The language of it may not be open to interpretation. Clear statements like:” I quit my job” or “I want to terminate the employment contract” qualify. More vague statements don’t. It is also desirable that the request contains the date of the last working day, in order to avoid confusion. The employee needs to inform the company beforehand about wanting to quit. One should start counting these days the day after the request has been submitted. It is however not necessary that the employee still show up at work during this period after he has submitted the request to be dismissed. Often times the relationship will be damaged and it will be better to grant the employee a holiday during this period. Taking a holiday does not affect the way the term is calculated. As long as the above-mentioned terms are still running the employee has the right to change his mind and to withdraw his request to be dismissed (Article 80 paragraph 4). Unless you already hired someone else instead of him you will be obliged to take him back in such a case. If your Russian venture hasn’t brought you what you hoped it would and you have decided to liquidate your Russian company you can use this procedure to get rid of your labour law obligations. In such a case you need to inform the employees before signing the decision to liquidate the company. When you are liquidating a Russian company you have to appoint a liquidator or a liquidation commission. After being appointed the liquidator (liquidation commission) takes over the responsibility for the control of the company from the general director. Since the liquidator will be responsible for adhering to all legal formalities, of which there are many, he should have a good knowledge of Russian law or be assisted by someone who does. 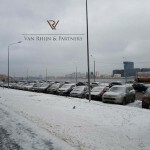 At Van Rhijn & Partners we offer the possibility to take on the role of liquidator for our client’s company, so that you can be sure that everything is handled correctly. This is a complicated procedure for which the union also needs to be consulted. In order to do this the right way, the employer must undertake many actions in an algorithmic fashion. Moreover, the employer is not free to decide who can stay and who will be dismissed. First of all certain categories of employees cannot be dismissed in this such. Pregnant women, to name an example. After the employer has determined who may not be dismissed and who may, he must then look at the qualifications and the performance of the employees. The higher performing and better qualified should be proposed to stay first. An amendment from 2016 it proposed adding people with a mortgage to the category of people who may not be dismissed according to this procedure. It still hasn’t been voted on, but if the DUMA decided to approve this amendment, the consequences will be huge. Since many Russians have a mortgage, it will become practically impossible to fire someone according to this procedure. From sheer necessity companies will look for alternative procedures to dismiss their redundant staff. Here the Russian state transfers its duty of care towards its citizens to the private sector. I don’t think that that would be a wise decision. Those employees, who are eligible to be dismissed should be offered other vacancies within the organisation. The general rule when dealing with this form of dismissal is to grant the employee compensation for unused holidays and compensation for dismissal (выходное пособие). This compensation for dismissal should at least amount to 1 average monthly salary. If the employee hasn’t started working another job one month after dismissal he can upon showing his employment record book (as a proof that he has indeed not been hired elsewhere) demand payment of a second month of compensation for dismissal. If he registered himself at the employment agency as a job-seeker and still hasn’t found work he will upon showing proof of this, also be entitled to a third month of compensation for dismissal. It is, however, possible that to the sector in which the organisation operates different rules apply, which have been in a collective labour agreement. In such a case you have to propose an alternative job, for which he does possess the necessary skills. If possible. According to Article 181.1,, it is not allowed to pay compensation when dismissing an employee for disciplinary reasons. It is not possible to deviate from this norm in the employment contract. On the last working day, the employer must hand over the employment record book and other work-related documents to the employee, for the receipt of which the employee must sign in the logbook of employment record books and on his personal card. Further, the employee should be paid his salary, compensation for unused holidays, and other money to which he is entitled. If parties have agreed to terminate the employment contract by mutual consent, this can also be laid down in the agreement to terminate the contract. Besides many other things, this order needs to contain the Article on the basis of which the employment contract will be terminated. The order is not a mere detail. It should be signed by the employee. If he refuses to sign it an annotation about this should be made on the order. Yes, brevity isn’t a common quality among the Russian legislature. Without attempting to translate the whole thing I will suffice to say that it is a document about salary and other payments to the employee during the past 2 years. You must be very precise when dealing with procedures of Russian labour law. It might not be enough to do things more or less right, you must do them exactly right, or you might run into trouble. In almost all cases you will want to consult a lawyer. If you are worried about finding the right way to dismiss your employee, I or one of my colleagues offer the possibility to either assist you in this processor to take over the process entirely over from you. You should also realize that if you’re terminating an employment contract without a term unilaterally, you will have to deal with bureaucratic and time-consuming procedures unless the employee quits by his own initiative of course. If at all possible, it is, of course, preferable to part on good terms. If someone feels treated unjustly and goes to court you might incur more costs, even if you win the case. So it’s always better to take on a pragmatic approach. 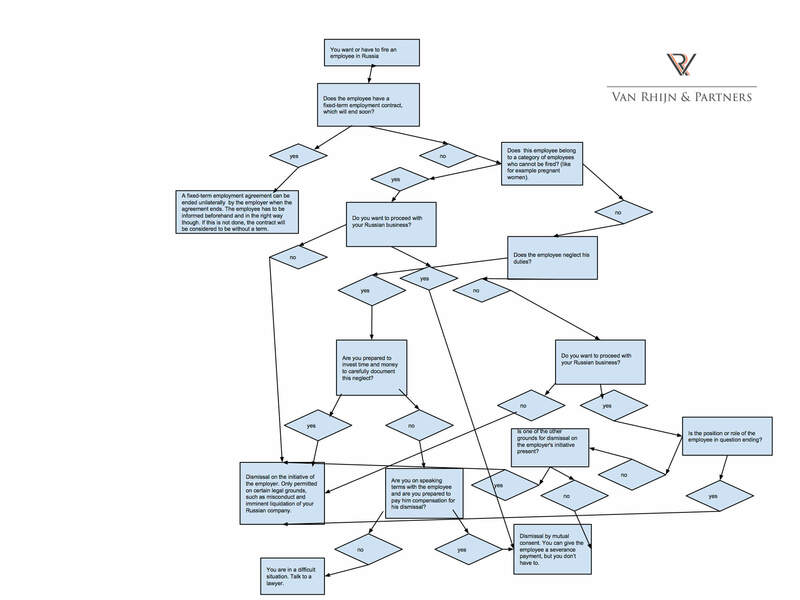 Van Rhijn & Partners will be happy to assist you in this not always easy process. You can contact us through the contact form or leave a comment below.